Wonderland is the biggest amusement park in the Northwest. It's located in the small town of Seaside, has a giant ferris wheel and a creepy Clown Museum, and has generated a lot of money over the years. It seems everyone in Seaside has worked there at one time or another. So when a dead, decaying body is left in the midway for the Wonder Workers to see, Vanessa Castro begins to unravel Wonderland's secrets. Vanessa is new to Seaside and is the new Deputy Chief. 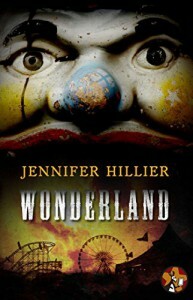 It's her first day on the job and she has to find the missing teenage employee of Wonderland whose picture of himself at the very top of the Wonder Wheel went viral just before daybreak - around the same time the unidentifiable man was left near the bottom of it. This took me a while to get into. It feels as though there was something missing - large chunks of the book had nothing really happening. The twists weren't really surprising; they seemed, for lack of a better word, planned. I loved the amusement park itself. It wasn't a bad read but it left me wishing I had gotten more out of it.